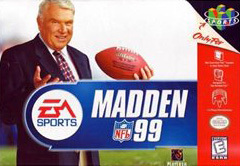 Madden NFL '99 for Nintendo 64 features both NFL and NFLPA licenses, so teams will have authentic names, colors and logos in addition to the real players. Over 110 classic and modern NFL teams have been included with team-specific playbooks. For 1- 4 Players.